Push button ignition installed, pictures! So I try to start my car about a month ago and I feel the key go limp. I snapped the little metal tab that engages the ignition switch (the white thing between my left thumb and fore finger in the following picture). The chrome toggle on the left is wired to both "key in" and "ignition on" contacts on the ignition switch wiring harness. I could have separate switches but I did not have enough room. The only loss is that when I shut down the engine the radio immediately shuts off and the interior lights immediately come on as if I shut down and removed the key right away. 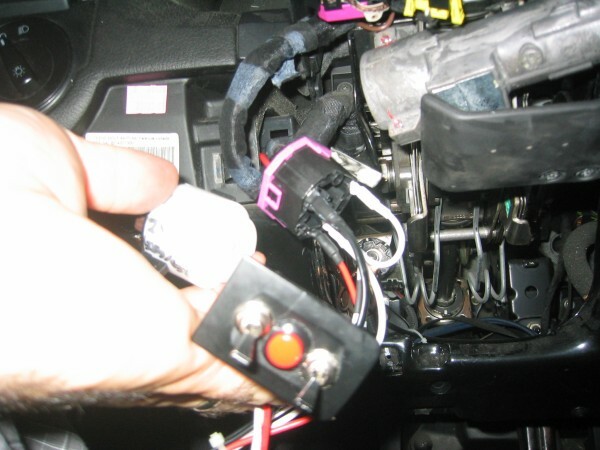 The toggle on the right is wired in place of the "on while running but off while starting" contacts of the ignition switch. I just turn it on after the engine is running. It controls the AC, fans, DRLs, wipers and turn signals, and probably more this is just what I have discovered so far. It is not possible to start the car without the key in. The immobilizer has not been modified and also you need the key in and turned forward to unlock the steering. Set left toggle to "RUN"
Set right toggle to "RUN"
Set both toggle to "STOP"
So, does anyone else have a push to start button on their TDI? Please post pics! Last edited by NarfBLAST; August 18th, 2010 at 20:10. Sorry not feelin it. Looks a little redneckish to me. Saving grace? MacGyver-izing your steering column to bypass a broken lock cylinder. Your resale value just went way up, in Ontario. If you omit pertinent info from your question, you cannot reasonably expect a good answer.//Not affiliated with any vendors except as a customer.// Wise people lurk more.// I'm not a guru.// 'I got actual real friends in the real world'-T'sTDI/ If you were the only entry, there wasn't a race.// Grammar and spelling really are important, but I don't claim to be good at it.// Typical drivers can't. Interesting, I would almost want to "install" one without the ignition broken. Yes, it looks "a little" redneckish, but I give it a "10" for inginuity and "cheapness". Now to find better looking switches and clean it up for version 2. Thanks for the replies and comments, keep 'em coming. Yes this is only temporary, unless it works. I threw it together pretty quick and had to shave down the plastic button to get the switches to fit. I was thinking of getting a bigger button but not sure where to put it. S2000 push start button FTW! Sorry, gotta disagree with you there! I think this is the ULTIMATE use for the FUNK or GAS switch!!!!!! 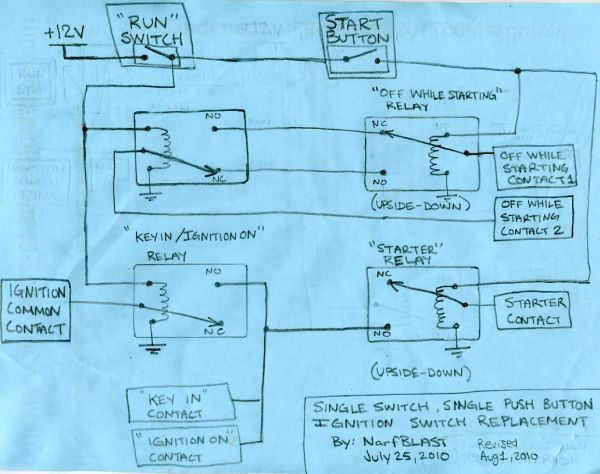 Could have run the "off while cranking power" through the first toggle switch and used a relay activated by the push button to disconnect it. Or a DPDT push button could have been used. Is it April 1 again already? You got to be kidding! My only suggestion is if you're going this direction, go all out and use those 3" toggle switches you see in the cockpit shots of NASCAR cars. In all honesty though, your $hit broke, and you fixed it in a creative and functional way. Props to you even if it's a little off the wall. That is really cool Narf. Something like that would be great for pulse and glide. Thinking of lowering? Read This first. 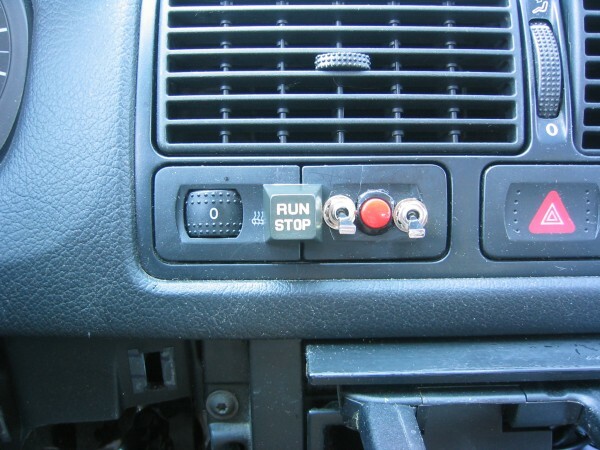 remove the run/stop keyboard key and your setup is like having your own anti theft system. Fuel Economy: Is just one piece of the puzzle that is our bottomless appetite for oil. Cars don’t have to be consumable. Instead of throwing them away, we can rebuild them, better. We have the technology. I have to give you a big thumbs up for this outrageous fix, Narf! I'd like to suggest that you replace the switches with ones that you are less likely to hit while reaching for a drink or the radio, or while driving aggressively or in an emergency. If they could all be push-button on/off I think it would be safer. Not a big deal, just a suggestion. fix our discourse, fix our world. Last edited by manual_tranny; July 23rd, 2010 at 22:07. I just finished building this into a wiring harness, I tested it and it is ready to plug in, just waiting for daylight!